In recent years, wave after wave of technological advancement has led us down roads that are beginning to look more and more like science fiction stories. In their efforts to bring us from science fiction to science fact, Microsoft Research showed us a new communication medium called Holoportation earlier this year—and now they have found a way to make this highly complex holographic system far more mobile. 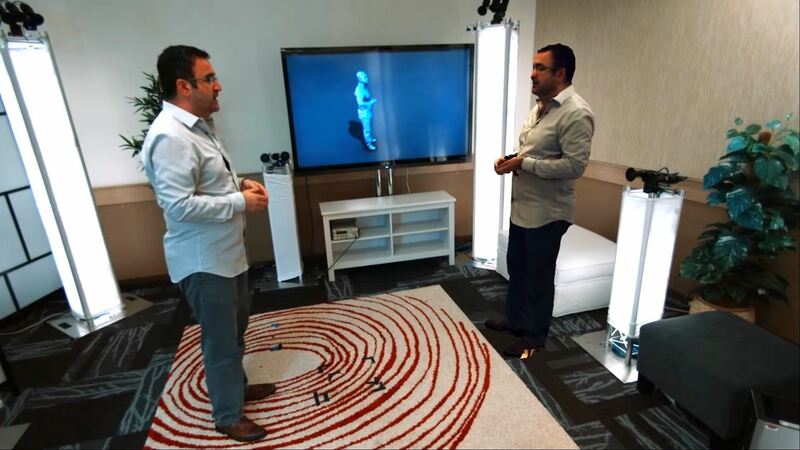 Holoportation is a system that uses a large collection of 3D and depth cameras, similar to what a company like Point Grey has to offer. These cameras, placed strategically around a space, allow the user to broadcast a fully 3D version of him or herself. A HoloLens user on the receiving end can put on the device and not only see the user, but see the space they are in, as well. The Holoportation process involves stitching the results of the camera feeds together in real time, then sending that info over to the remote user. As you can imagine, up to this point, this process has required some heavy computing power and data bandwidth. This hefty workload could make this technology a long way off from becoming mainstream, but Microsoft just found a way to put this system in a vehicle. To accomplish this, we reduced the bandwidth requirements by 97%, while still maintaining quality. This new mobile Holoportation system greatly increases the potential applications of real-time 3D capture and transmission. Of course, there is always a catch. "The bandwidth required by Holoportation has been reduced to 30-50 Mbps. This allows us to use Holoportation in a moving vehicle, as long as we are within WiFi range. We will be moving to cellular data soon!" Microsoft's research post stated. One approach Microsoft used to reduce both the processing power and bandwidth needs was by lowering the number of cameras. The new version of the system only uses two cameras instead of eight or more. The more cameras there are, the better the quality of the 3D model being broadcast, so there is definitely a tradeoff between quality and accessibility. I personally don't have access to my Wi-Fi connection when I am driving, and where I live, I don't think I have that kind of bandwidth to begin with. If they got the bandwidth down to 30-50 Mbps, I can only imagine what it was before. For now, I will keep an eye out for the cellular version.